The U.S. government pitted two companies—the Union Pacific and the Central Pacific Railroads—against each other in a race for funding, encouraging speed over caution. Locomotives, rails, and spikes were shipped from the East through Panama or around South America to the West or lugged across the country to the Plains. In Ambrose’s hands, this enterprise, with its huge expenditure of brainpower, muscle, and sweat, comes vibrantly to life. I initially picked this book up to help in my PhD research, intending only to look through the index and make notes on the parts and people who I needed; instead I found myself reading this book from cover to cover. I am not a railroad enthusiast by any means, but I found the story of how the railroad was built across America to be fascinating and, from reading this book am now intending to research into this subject a little more. The Author always writes good books based upon historical events, but I am a little wary as to how factual their accounts are, and this book was no different. 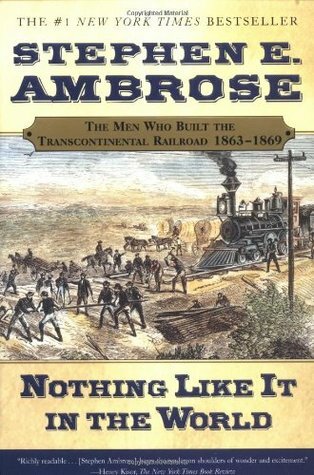 My main problem with this book was how the Author appeared to praise and admire those men in big business that funded the railroad, but did little of the actual work itself. I was hoping to find more on the plight of the Chinese, Irish and Mormon labourers as well as details about life in the hell on wheels towns they lived in that followed the railways progress as well as the encounters the workers had with the Native Americans and Homesteaders who refused to relocate so the railway could cut through their land. Despite this lack of detail that, in my opinion, would have resulted in a first class account of the building of the railroad, the Author does an excellent job when writing about the backbreaking and soul-destroying amount of work that went into laying every mile of these tracks. With a skilful pen he makes the reader realise what a momentously huge project this was, and how much of an accomplishment in the advancement of westbound migration the railroad was. If you are interested in this period of American history, or in railroad history, this is a book that you would enjoy; although I would recommend doing additional reading and would recommend Empire Express for a follow-up book, as well as a book written by William Francis Bailey. This entry was posted in No Spoiler Reviews and tagged 3 Thumbs, Adventure, America, Chinese, Historical, Irish, Mormons, Non-Fiction, postaday, Railroad. Bookmark the permalink.